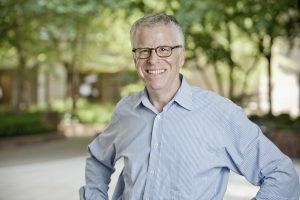 Tom Rosenstiel is a leading authority on journalism in the 21st century. As Executive Director of the American Press Institute since 2013, he has led API’s efforts to anticipate issues, conduct research and create resources to help journalists chart a path forward in a rapidly changing media environment. Previously, he cofounded and spent 16 years as director of the Project for Excellence in Journalism at the Pew Research Center, focusing on trends transforming journalism. In 2014—long before the term “fake news” became ubiquitous—the American Press Institute embarked on a project to improve political fact checking in journalism. With the effort hitting its stride during the height of the 2016 presidential election, API was immersed in a powerful teaching and learning laboratory. Supported by grants from the Rita Allen Foundation, the Hewlett Foundation and the Democracy Fund, API studied best practices and helped journalists, students, faculty and citizens better understand the process of political fact checking. They also organized new research in the field, with topics including the impact of fact checking on political rhetoric, the effectiveness of ratings systems like The Washington Post’s “Pinnochios,” and readers’ and journalists’ changing perceptions of fact checking. I recently spoke with Tom about prospects in fact checking, the role of philanthropy in the media landscape, and what he sees on the horizon for journalism in the public interest. Your work is right at the heart of so much discussion these days. What dynamics define the ecology of news and media right now? Journalists feel like they’re under an existential, and maybe epistemological, threat. We are actually having conversations out loud and online and in print about what is a fact, what is evidence. On one level, I think journalists feel threatened by that. On another, I think it’s going to make journalists and journalism better. Even some of these conversations about what is the difference between a falsehood and a lie—journalists are going to the dictionary and having very deep conversations. The result of that in many places is going to be positive. We had a conference where we gathered people who did fact-checking journalism, along with scholars and technology companies. One of the takeaways of that gathering was that analyzing a given fact and a given claim by a political actor is probably very crude. It’s insufficient. What people are really responding to is a belief system. In some ways, fact-checkers have been too small-bore, too literal. They have been focused on fact checking individual claims but not focused on the broader beliefs implied by the claim. If someone has exaggerated a claim about an issue, the issue itself, the general knowledge about that issue, is probably more important than the facts of that one claim. As one person put it at that event, I think we’re going to move, after this election, from fact checking 2.0 to fact checking 3.0, which is going to be a much broader understanding of it. If that’s true, that’s actually a good thing. What came out of the work you were doing last year? A lot of the research focused on what causes people to trust. Trust has basically been declining for 25 years—in many institutions, but the press even more acutely. We’re at the point where two-thirds of people say they’re pretty skeptical about the media. We asked what concretely and specifically might cause people to trust one news organization more than another. People trust news organizations that they can use a lot, which means they like news organizations that have the news fast, but they also like news organizations that provide them with real depth and context and knowledge, and not just speed. That’s a challenge—you’ve got to be with them a lot. You’ve got to do both. We’re also testing what causes people to trust in social media environments. People who use Facebook and Twitter a lot are highly skeptical of what they see there, and yet it’s increasingly the place where they get their news. They say that they’re very mindful of what the news brand is that they’re consuming, but some new experiments we just published suggest they’re not as good as they think. Actually what’s influencing what they trust is which one of their friends shared it, not who reported it in the first place. This is really interesting—the social aspect of things. This idea of the contagious element, of echo chambers. How are you approaching that problem? One thing is that labeling is extremely important, particularly as we’re seeing content in social media or on a phone. You click on a top story or politics, and opinion pieces, analytical stories and straight news reporting are mixed together. Sometimes you wonder, “What neighborhood am I in?” We need to go back to much stricter labeling, something that in the 1980s and 1990s many publishers began to wander away from. I also think there’s something to an idea I have called organic news literacy. Up to now we’ve thought that the atomic unit of news was the story: I’ve done my reporting, I’ve put it in a beautiful narrative. Maybe in this environment of fake news, what matters is actually the reporting you did, not the story vessel. How do you feature that you have very good reporting in a story? Imagine a story and there is a series of questions at the top. One is—what’s new here? Another is, who the source is. A third one might be, what’s the evidence for this? What do we not know, or what questions do we still have? You mouse over the questions and the answers pop up. I think that would do three things. One is, I think the reporting in the stories would be better if you knew it was going to be explicit like this, and you couldn’t write around it. The second is, I think there would be a kind of organic news literacy that would happen. You would gradually begin, through osmosis almost, to see these as pertinent questions to whether this is reliable reporting. I like that. That makes a lot of sense. A third element here is, I hope, fake news couldn’t do that as easily, because they don’t actually have reporting. What about the role of philanthropy? You just released guidelines for funders and nonprofit media. Where does that fit into this universe that you’re exploring? Nonprofit news is just going to become more important as the financials behind commercial news continue to deteriorate. I expect to see more nonprofit media, particularly on targeted topics that might be missed. The election of 2016 puts in very stark relief a worrisome trend that we are going to fall into ideological filters—where we lose a common space, particularly about politics and political issues. I worry that some of the nonprofit media will play into that—for example, there will be websites for people who believe in climate change, and websites for people who are disbelieving in climate change. That’s a challenge for nonprofits—to create reporting that is recognized by a broad swathe of the population. To do that, the guidelines that we all worked on together become even more important. How do you ensure perceptions that the reporting is done in good faith? It’s not actually enough, as hard as it is, to simply do good reporting. We now have to think about how do we distribute that reporting in a way that creates knowledge for people who may be skeptical—where you’re adding knowledge rather than just preaching to the choir. As much as nonprofits and funders have thought about it and still have issues, commercial media that are partnering with nonprofits and nonprofit funders have thought about it less. If a partnership comes along, they don’t really have written guidelines and they don’t really have rules of the road. It’s new territory for them. You mentioned niche media. How do you think multiple, diverse voices can be brought together? This may be ridiculously optimistic, but I think we will begin to see people across the ideological aisle and partisan aisle try to come together on certain facts, on certain common ground. For instance, there was a piece in [The New York Times] about a group of conservative elder statesmen who are going to propose to the White House a carbon tax approach for climate change. That is a very subtle and sophisticated way of saying, let’s move off the debate over whether there is or isn’t climate change, and suggest an approach to pollution that fits a conservative philosophy of governing. I believe we’re going to begin to see more efforts like that, and some of those things are going to win a middle ground that’s bipartisan. The existential threat that’s coming from the political realm also has the potential to depolarize some of the journalistic realm that we see. Will people seize on that? I hope so. Let’s go back to the idea of places where people might entertain different points of view. Tell me more about what you’re finding. One big area is what causes people to decide that a news organization has so much value to them that they are willing to subscribe. If you, like The New York Times, decide that you’re going to try to generate more of your revenue from people paying you directly, that has a lot of implications. Your metrics need to be different. If you’re making your money from advertising, then the page view is the beginning and the end of your metrics. How many eyeballs? If you are trying to describe how much value you have in people’s lives—are they willing to contribute, become members, or subscribe—suddenly you need to know what content has special value for people. Your metrics include page views, but they also encompass read time, social activity, sharing. What is something that people were reading three months later? Once you begin to measure your digital content that way, you discover, as we have in our research, that in-depth content actually does quite well. The other thing that you begin to do is understand your audience at a deeper level. You may start to create reader segments, where you say—these are people who come once a month or less; these are people who know us, we see them a couple times a month; and you may have people who are your stalwart sort of subscribers, who come 10 or more times a month. Data science suddenly becomes important to you as it never was before. As you’re looking forward to the coming years, what’s really on your mind? One thing we want to experiment with is this idea of taking fact checking to another level. I’m very intrigued by the idea of making the key unit of fact checking not a claim or a fact, but an issue. You might say, in our town, the big issues are traffic, transportation, water quality and air quality. What are the five things you need to know about each of those issues in our town? You’re creating knowledge around them. So, the knowledge people are craving is really about the issue, rather than about a person and a party. How do you think about your work in terms of what might be at risk? At a local level, most of the information that people get about civic institutions comes from newspapers. If they go away or drastically shrink, because the economic model is so imperiled, there’s a point that cities, certainly urban communities, will be essentially unmonitored. There have to be technology solutions to this, but I don’t see us moving quickly enough to them.